Grading periods define the start and end dates associated with quarters, trimesters or semesters. They are different than terms. You will need to enter grading periods even if terms have been set in Illuminate. 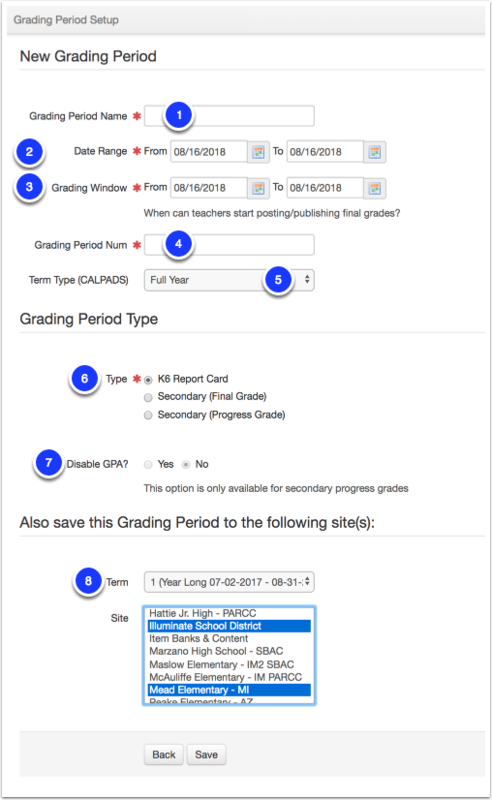 Setting up grading periods correctly is critical for the use of Gradebooks and Report Cards. Note: Grading periods cannot be created to overlap terms. If you will be using elementaryandsecondary grading periods,set up all elementary grading periods first. Not doing so, could cause issues with elementary report cards. Elementary: Grading period numbers impact report card entry and printing for elementary report cards. Secondary: Grading period number order should follow the order grading periods will land when printing during the school-year. 2. Under Setup, click Grading Periods. 3. Click Add to add a new grading period. 1. Name the grading period. 2. Enter the first and last dates that grades will be recorded. 3. Enter the first and last dates that teachers can enter/post grades for the final mark. 4.The grading period number is sequential, beginning with 1. 5. The term type is selected based on CALPADS. 6. Make the appropriate choice. 7. Select No to Disable the GPA if you select Secondary (Final Grade). 8. Select the term and sites you would like this grading period to apply to. To select multiple sites, hold down command/CTRL and select all applicable sites. Note: The Also save this Grading Period to the following site(s) option only displays if you are logged into the district site in the Control Panel. Repeat these steps for each grading period throughout the year. When grading periods are entered, you will see a summary of this information. Grading periods can be created at the district level and associated with multiple sites. Grading periods must be edited individually at the site level.